Peruvian Cuisine: Ocopa Arequipena 1. Recipes. Video Description: Aventura Culinaria (Culinary Adventure): Ocopa Arequipena 1/3 by Marco Barandiaran. Ocopa Arequipena A dish with some similarities to Papa a la Huancaina. It consists of boiled and sliced yellow potatoes covered with a sauce of made of aji (chili pepper), walnuts, a Peruvian herb called "Huatacay" (that gives it a vivid green color) or "Huacatay" as people from Lima, the capital call it, and fresh or white cheese, sided with lettuce, boiled eggs and olives. It is usually served in restaurants specialized in Peruvian Typical or Creole Food or restaurants serving food from Arequipa, a southern Peruvian City. Peruvian cuisine is considered one of the most diverse in the world. In January 2004, The Economist said that "Peru can lay claim to one of the world's dozen or so great cuisines", while at the Fourth International Summit of Gastronomy Madrid Fusión 2006, regarded as the world's most important gastronomic forum, held in Spain between January 17 and 19, Lima was declared the "Gastronomic Capital of the Americas". 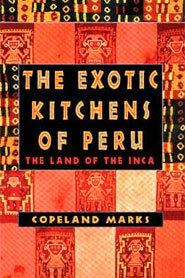 Exotic Kitchens of Peru: The Land of the Inca by Copeland Marks. It's little wonder that interest in Latin American eating is heating up these days. As Marks demonstrates in his latest culinary adventure (his previous cookbooks introduced us to the cuisines of Burma, India and Indonesia), Peruvian food is as rich and complex as its history. The recipes, gathered from professional chefs and home cooks, reflect this multicultural mix of the fallen Inca Empire and of the successive waves of Spanish conquerors, African slaves, Chinese laborers and Italian and Japanese immigrants who made Peru their home. Tallarin de Pollo (Spaghetti and Chicken) is seasoned with Peruvian chili peppers and cumin, while Ocopa de Camarones (Spicy Shrimp Paste with Potatoes) features the coastal shrimp alongside mountain-grown potatoes and peanuts introduced from Africa. Among the surprisingly simple recipes for ceviche--regarded as the Peruvian national dish and made of raw fresh fish marinated in citrus juices that "cook" the flesh--is one for Ceviche Japones. Carefully researched, with information on the historical and cultural significance of various dishes, the book is occasionally more appealing to read than cook from; it's probably one of the few cookbooks with a traditional Inca recipe for Cuy Frito (Crisp Fried Guinea Pigs). But Marks has easy, practical advice on how to adapt even Piranha Broth (use perch or sunfish instead) to the American kitchen, proving there's more to Peru than just small potatoes.